Additional remarks: this beautiful necklace is stamped with the French eagle head essay mark to guarantee its 18K solid gold content. It also has been tested in our lab for metal purity. 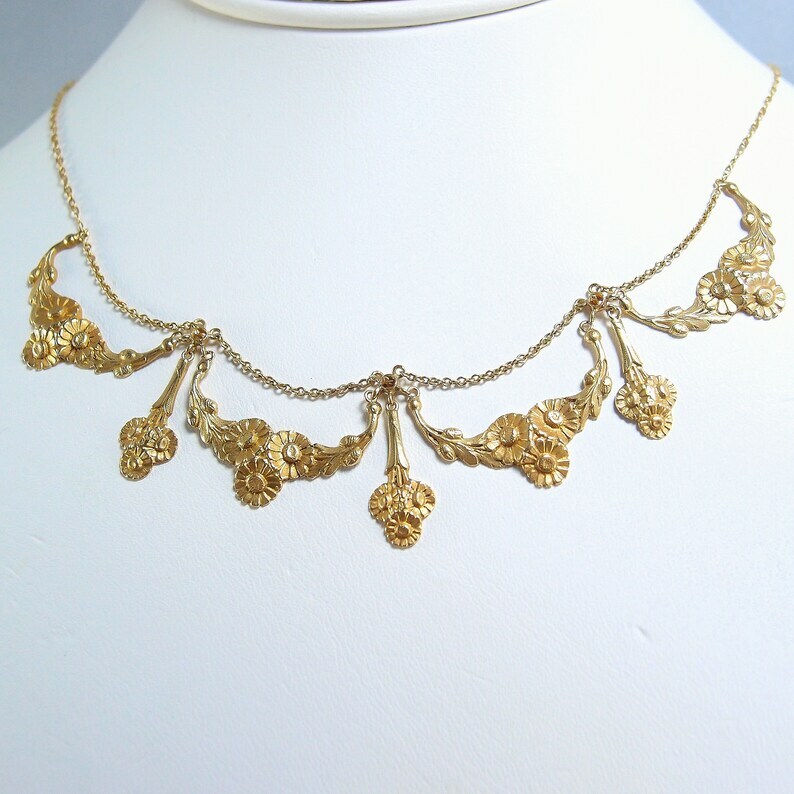 This is a genuine Art Nouveau gold bib necklace crafted in repoussé 18K solid gold. It features 4 festooned floral motifs linked together, separated by a 18mm long floral drop, and suspended on lovely cable chain. It was the one of the featured items in an exhibit, held in a French gallery, on women's clothing and accessories during the Napoléon III, the Victorian and the Edwardian eras. Each of the four festoon shields are composed of 3 flowers and leaves, crafted in repoussé gold. The foliate and floral motif is replicated on the 3 drops that separate and unite the festoon shields, and dangle gently from their base. 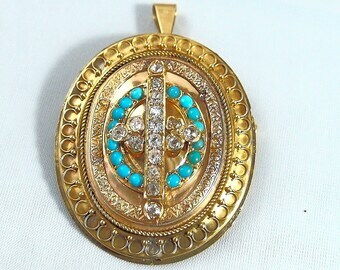 The back of the necklace is plain and solid gold. The necklace closes with a spring coil. There are no repairs or damage to the necklace. This gorgeous necklace is in wonderful condition and it is all original. The Art Nouveau period took place approximately between 1890 - 1920. This quality fine jewelry piece is a clear representation of this fascinating period. 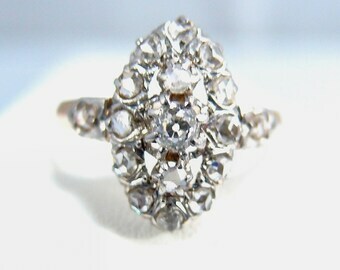 Genuine jewelry from this period is getting more and more difficult to find and yet, its popularity to-day is increasing. If you come across a piece of authentic Art Nouveau jewelry which strikes your fancy, you should not hesitate. 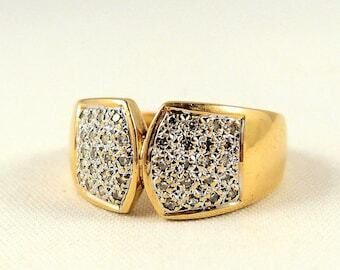 Inventory will not increase and everyone is looking for that one-of-a-kind authentic piece.